This year, the legendary 9:30 Club will actually be celebrating a double anniversary—35 years of existence and 20 in its current location. The Club has hosted the likes of everyone from Johnny Cash and Nirvana to the Smashing Pumpkins and Foo Fighters, and even modern acts like Twenty One Pilots and Halsey. From January 5-7, 9:30 Club will hold a free World's Fair exhibition in honor of the double anniversary. A limited number of free tickets will be released on December 7 at 10 am EST through Ticketfly. The Club has also announced the release of a limited edition, 264-page hardcover book commemorating the history of the venue. The book will feature never-before seen photos, stories and firsthand accounts of experiences during the 9:30 Club’s tenure from Ian MacKaye (Minor Threat, Fugazi, Dischord Records), Chuck D of Public Enemy and more. The book will become available at the World's Fair. You can preview it here. 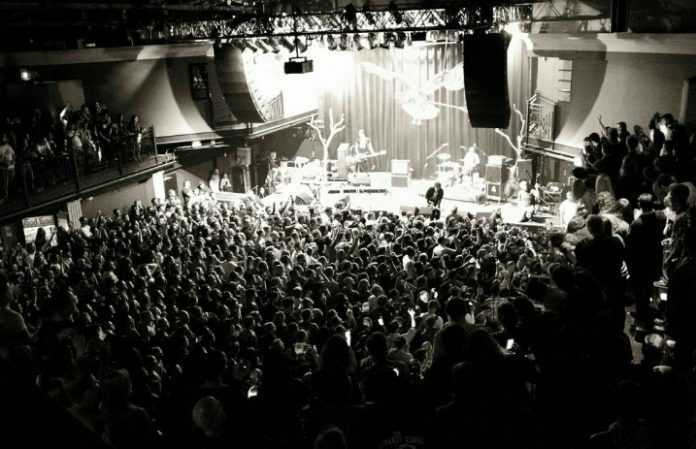 Founded by Dody DiSanto and Jon Bowers, the 9:30 Club originally opened in 1980 in downtown Washington, D.C. The Club’s name was derived from its street address, 930 F St NW. In 1996, co-owners Rich Heinecke and Seth Hurwitz moved the Club to its current location at the eastern end of the U Street Corridor.